Secular music from the Naxos family of recordings with popular songs of Italy, lute music of Poland, and music for wealthy gentlemen. I. Polonica (Michał Gondko, lute). Ramée CD RAM 140-6. In addition to the works attributed to the lutenists active at the Royal Polish court in the late sixteenth century, there is a substantial repertoire of compositions identified as ‘Polish dances’ or ‘Polish songs’ which have been preserved in numerous sources of late Renaissance lute music. Characterized by an irresistible melodic charm and a straightforward harmonic and rhythmical texture, such musical polonica spread across Europe, achieving what might have been the widest distribution of musical ‘Polishness’ before Chopin. 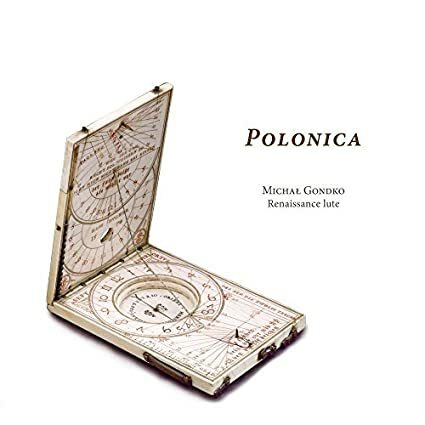 Four hundred years later, Polish lutenist Michal Gondko sets out to trace polonica in lute tablatures from around 1600, and presents a selection of forty compositions, many of which have not been previously recorded. II. 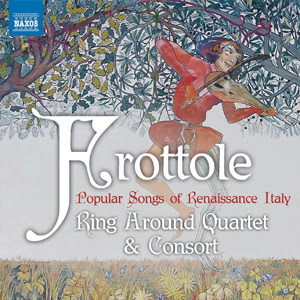 Frottole: Popular Songs of Renaissance Italy (Ring Around Quartet & Consort). Naxos CD 8.573320. From Opera News: In Renaissance Italy, the term “frottola” applied to light, strophic songs, and with their flexible format they have provided material for early-music ensembles ranging from amateur recorder groups to high-level professional performers. The three or four parts can be sung or played in various combinations, and opportunities for improvisation abound. The Italian vocal quartet Ring Around, joined by five instrumentalists, takes a satisfying, lively look at this repertoire. With its chord-based texture and straightforward rhythms, the frottola has little to do with the later madrigal, where musical gestures reflected actual words in a learned contrapuntal style, and by 1520 the frottola had died out completely. Beginning as court entertainment and spreading from Naples to Ferrara, the frottola quickly moved to the amateur sector when the pioneering printer Ottavio Petrucci brought out several collections in an easy-to-read format. Tenor Umberto Bartolini is an engaging performer with an attractive, easy sound, and his drunken opening to Zesso’s “D’un bel matin d’amore” is amusing without exaggeration. The disc closes with “Lirum, bililirum,” where the voices imitate the droning of the bowed lira da braccio in Bergamasque dialect. III. 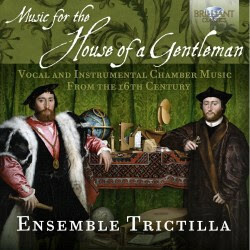 Music for the House of a Gentleman (Ensemble Trictilla). Brilliant Classics CD 95090. From MusicWeb International: Music was one of the main preoccupations in the highest echelons of society in the 16th century. Learning to play an instrument or to sing was part of the education of any true gentleman. That word is derived from 'gentle' which an early 17th-century Italian dictionary defined as 'noble, gracious, courteous'. "The gentleman who studied and cultivated music was a true dilettante, in that he practised the art of music for his own delight (diletto) and education", the liner-notes to this disc state. Until well into the 18th century members of the aristocracy who were active as composers used the word dilettante to distinguish themselves from those who composed for a living. The social status of the latter was rather low. The 16th century was the time when music printing became a major business. Several music publishers printed a considerable number of collections with vocal music (chansons, madrigals) or instrumental pieces, mostly dances. Such music was aimed at the upper class to play and sing privately or with family and friends. That also influences the way this repertoire is performed. "The noble dilettante's chosen instruments were the lute, the harpsichord, the lyra da braccio and of course the voice. No self-respecting gentlemen would have accommodated in his own dwelling the vulgar instruments of street music: cornets, trumpets, crumhorns and percussion". The mentioning of the latter is especially interesting as many recordings of 16th-century dance music include percussion which some performers seem to consider indispensable. This disc proves otherwise as the programme includes several dances whose character comes off perfectly in performances with a string or a plucked instrument or various combinations of instruments as used by gentlemen in the renaissance. The recording dates from 2006 and was originally made for the exhibition "At home in Renaissance Italy" in the Victoria and Albert Museum in London. It comprises a wide variety of forms as were common in the renaissance. Dance music figures prominently, and among the dances are several which have their origins in folk music. However, here they are presented in a more 'sophisticated' way, in line with performance practice among the higher echelons of society. Dances were sometimes intended for various instruments but were also part of the repertoire of single instruments, not only the lute but also the harp and various keyboard instruments. The track-list shows that vocal music was still dominant in the 16th century: many instrumental pieces were connected in one way or another to vocal music. At the time most of this was polyphonic, and to be performed by an ensemble of singers. However, it was also possible to perform them with one voice and a chordal instrument, such as the harp or the lute. In that case the singer took the upper voice and the instrument played a kind of 'reduction' of the remaining voices. That is the way we hear several vocal items here, such as one of Jacques Arcadelt's best-known madrigals, Il bianco e dolce cigno. Some madrigals were so famous that composers took them as a subject for arrangements. Especially popular were extended embellishments of one of the parts of a vocal piece, mostly the upper part. These were known as divisions, diminuzioni, passaggi or diferencias. This genre emerged in the last decades of the 16th century and foreshadows the instrumental virtuosity that was one of the features of the new style of the 17th century. The programme also includes a recercar by Ascanio Mayone, one of the main keyboard and harp players and composers of the time around 1600. This piece already reflects another feature of the seconda prattica which was born in the early 17th century: experiments in the realm of harmony. This is a most interesting recording which approaches the wide range of repertoire from the Italian renaissance and does so from a specific angle. It gives some idea of the various ways in which vocal and instrumental music could be performed. The interpretation leaves nothing to be desired. The singing and playing by the members of the Ensemble Trictilla is first-class and the programme is put together in such a way that a maximum variety is guaranteed. The liner-notes are informative, and the booklet includes a specification of the instruments used and a list of the sources from which the music is taken. Unfortunately lyrics of the vocal items are not included. This is musical entertainment of the highest order and the quality of music and performances makes this disc suitable for repeated listening. Giorgio MAINERIO (1535-1582), Jacques ARCADELT (1504/05-1568), Marco FACOLI (c1560-1590), Francesco SPINACINO (?-after 1507), Philippe VERDELOT (c1470/80-1522? ), Orlandus LASSUS (1532-1594), Vincenzo RUFFO (1510-1587), Francesco ROGNONI Taeggio (?-after 1626), Giovanni Maria DA CREMA (fl early 16th C), Ascanio MAYONE (c1565-1627), Francesco DA MILANO (1497-1543), Diego ORTIZ (1510-1570), Girolamo DALLA CASA (?-1601), Johannes Ambrosius DALZA (fl early 16th C). CD RAM 140-6, Naxos CD 8.573320, Brilliant Classics CD 95090.